A three month long project that focuses on creating design solutions revolving around the topic of garbage. Following our research, my group and I decided to concentrate on the rapidly growing problem of electronic waste, also known as e-waste. After primary and secondary research, interviews, and synthesizing our data, our solution focuses on mobile phones and interjecting our proposal in the existing process of buying and activating a new phone. 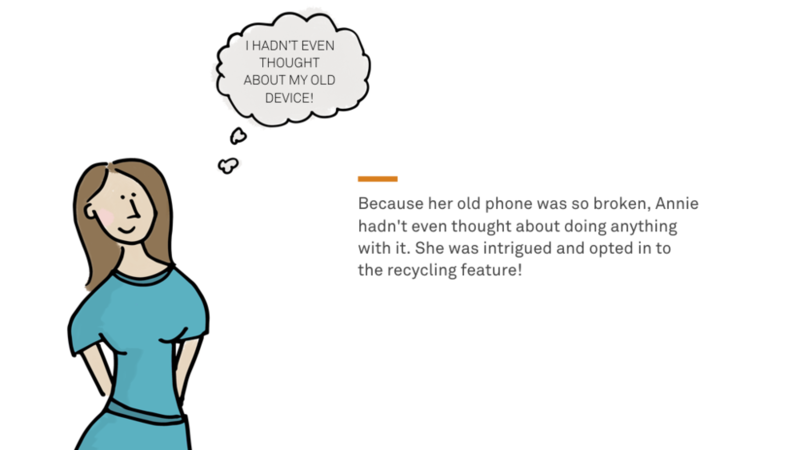 We created a program that easily integrates into the current process by rewarding people for recycling their old phones. How can we incentivize mobile phone users to recycle their old devices? During our secondary research, we looked at existing solutions for e-waste and what is currently being done to get rid of it. We found that people are not educated about electronic waste, that recycling does not necessarily mean recycling, and recycling electronics is not a priority for most people. We have formed three research questions that we wanted to answer by the end of our project. 1) What do consumers care about most when it comes to recycling old electronics? 2) Why do consumers keep unused electronics? 3) What available options are consumers aware of when it comes to replacing, getting rid, or disposing of electronics? 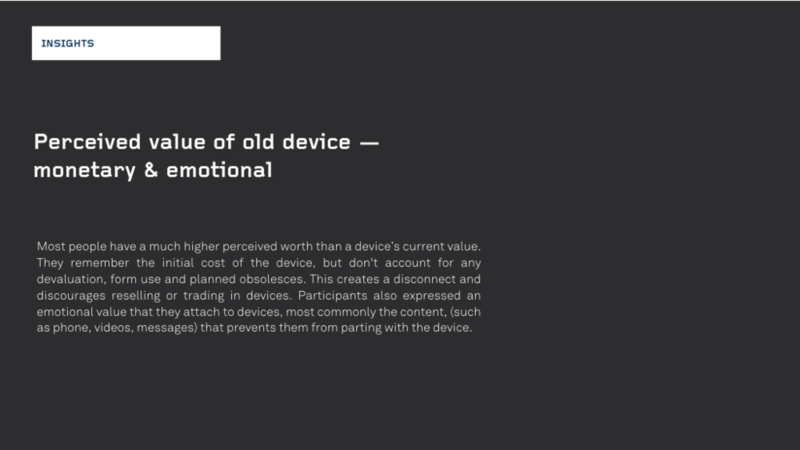 Our overall goal for our primary research was to understand the process of how people dealt with their old electronic devices after they stopped using them. In order to collect this data, we interviewed eight people. We generated some themes and insights from our research that could help us hone in on a specific area. While our initial design solutions showed potential, none of them would be able to stand alone in addressing our problem space. We realized that combining the positive aspects from each would be a solid foundation for our proposed solution. We are educating the users through onboarding during the initial device set up process, providing a convenient outlet to recycle old electronic devices, extending the life span of each device. 1) During set up, the users are prompted to recycle their old device. 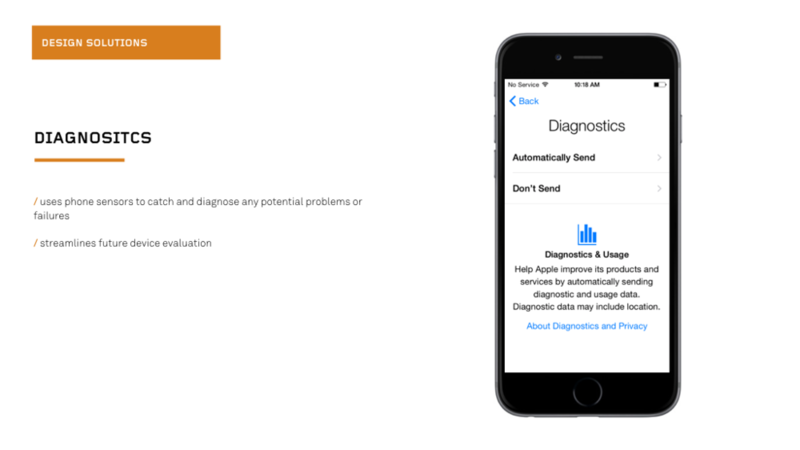 2) Their old device is evaluated by taking a picture and an instant appraisal is provided.